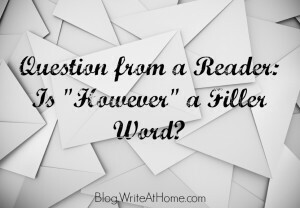 Home / Blog / Question from a Reader: Is “However” a Filler Word? I frequently get questions from readers on the blog here and on our Facebook page. Some raise questions that I believe others might be wondering, so I plan to make it a habit to address some of them here on the blog. I have my children enrolled in some of your [WriteAtHome] courses. I was taught not to use words like as a matter of fact, or however, because they are just filler words with no meaning. I’m confused. Can you enlighten me? Students habitually use filler words to extend the length of their papers without adding anything to the meaning. Sometimes we call it padding. This is certainly something to be avoided and something our writing coaches will look for and address. But phrases like as a matter of fact and words like however are not necessarily filler words. They serve useful purposes as transitional devises or conjunctions. However, in fact, is a particularly useful conjunctive and common adverb. It appears particularly often in academic writing. There are other words and phrases that are more often used as filler — well (as an interjection), truly, because of the fact that, etc. We address this issue at some point in our curriculum. What writing coaches should be looking for isn’t a particular list of words and/or phrases, but words that can be eliminated without changing the meaning or intended tone of a paper. Any word can be used constructively and almost any word can be used as unnecessary filler. The important thing is to understand how words are being used in a given context. Lists of no-no words often oversimplify the issue. If you have a question you’d like addressed about writing, grammar, or language in general, please feel free to leave it in the reply section below!